A lot of people don’t like the idea of sleeping on the floor and it can put many people off ever going camping. Sleeping on the roof of your vehicle is a wonderful way to have a unique adventure and a great experience. Getting the best roof top tent is difficult though, as there is a lot of competition out there. There are also plenty of features to think about too in order to get the best rooftop tent, and you want to make sure that you are going to be safe and secure while you are up there. The size is going to be an important factor as are the materials, installation, weight and accessories too. Here we will go through all of those vital features, explain why they are important and how they relate to you. Before that we have completed a roof top tent review on the 10 best products out there. Once you’ve finished reading this guide, you’ll be confident in choosing exactly what you need. This is a top rated rooftop tent from Tuff Stuff which ticks all the boxes in terms of what makes a great roof top tent. It has a strong aluminum frame which is going to be able to keep you firmly in place and also comes with a durable ladder and roof rack mounts. It comes with a 2.5” high density foam mattress which is going to be able to provide you with a very high level of comfort. The product is very easy to install and you will have your temporary home set up in a matter of minutes. It’s able to fold out over either the rear or the side of the vehicle and is made from durable ripstop fabric which also has a waterproof coating. Overall this is a brilliant product and the perfect roof top tent in which to have a great adventure. This is another brilliant product for car top campers and is going to be able to sleep up to 3 people but would give a nice and comfortable amount of space for 2. It comes with a high-density foam mattress and is able to take a maximum load of 661 pounds. The material of the tent is very thick and will be able to resist tears and be very durable. It also has a waterproof rainfly which is going to be able to keep you dry at all times and overall this is a product which is made from the highest quality materials. It is very easy to set up and you will be able to get it up in no time with the mounting brackets which are included in the product. It has anodized aluminum tent poles, a telescopic ladder and also interior LED strips which are a nice feature. 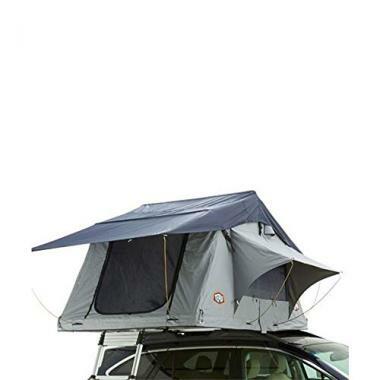 This car top tent from Tepui is going to be able to keep you safe and secure when you are up there on top of the vehicle and is able to easily mount to almost all roof racks. It is able to be installed with multiple different mounting configurations, giving you a lot of choice. The set-up of the tent is going to be very quick and shouldn’t take too long at all. It features a high density foam mattress which is going to be able to sleep 3 people with little room for gear or 2 people a bit more spaciously. The tent has built-in air vents which are going to help to reduce any condensation in the tent, and the door and windows are screened which is going to help to keep out insects and ensure that you are able to have a comfortable night of sleep. 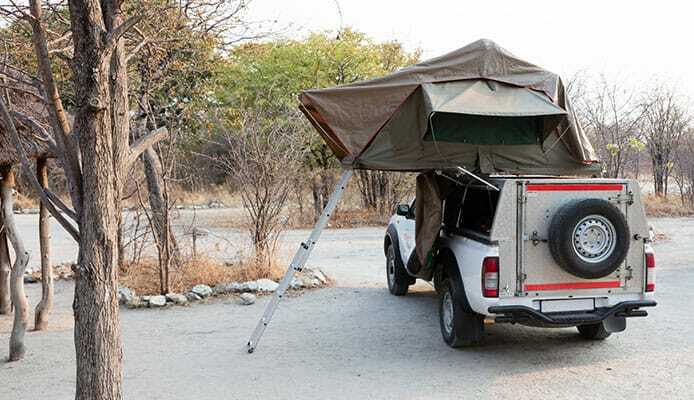 This is a truck top tent with a difference from TMB Motorsports as this is a product which is able to fold out directly from the roof rack to give you a comfortable sleeping space. It doesn’t have the capacity of other options but it’s highly convenient. Its design makes it incredibly easy to set-up and is able to fit most vehicle which has a cross bar or roof rails. It will be able to easily stay fully open once it has been fully extended and also has a pre-installed memory foam mattress which will give you a high level of comfort. Included with the product are a free flashlight and an extra storage bag but it also includes a telescopic ladder which is going to make it very easy to get in and out of your tent. This is a slightly different solution but one that works very well. This is a 3 season tent from Yakima which is going to be able to keep you dry and give you a comfortable night of sleep. It’s smaller than other products on this list as it is going to be able to comfortably sleep 2 people. The tent body is made from nylon and so is the rainfly too which has a PU coating over it. It’s able to hold 400 pounds of weight on its aluminum poles which should be enough for most users but it’s important to check it before buying. The material is breathable and it has mesh windows which are going to be able to keep you cool even on those warm summer days. The included ladder will give you easy access to the tent and overall this is a good product for those looking for something a little smaller. This is another product from Yakima but one which is slightly bigger as this is going to be able to accommodate three people and provides a very comfortable sleeping space. That is helped by their 2.5 inch mattress which is able to cover the whole of the floor. The tent is very easy to pitch and will be up in a matter of minutes without leaving you frustrated. The mattress also features a removable cover which makes the product very easy to clean and to care for which is a great feature. The materials are lightweight and breathable making this a great tent to be used in the summer or for those who are live in permanently hotter climates. This is a stylish product which is going to be a great option as an SUV roof tent. When it comes to a cartop tent you are going to be limited when it comes to size as there is only a certain amount of weight that you’re going to be able to put on top of a car and there’s only a certain amount of weight that a portable tent structure is going to be able to hold. If you’re looking for a 4 person sleeping option or above then sleeping on the roof isn’t going to be a viable option for you. There are other solutions that you could use in this situation such as simply having another standard camping tent with you or possible using an annex which a lot of products have available. Most of these tents are going to be able to sleep three people quite comfortably but if you are particularly tall or heavy then it might be the best idea to check how big the tent is in terms of its sleeping dimensions to make sure that it’s going to be able to suit you. A three person tent is going to sleep two people very comfortably with a nice amount of room which I suspect is what most people will be looking at doing. There are smaller options out there which are specifically for 2 people and are a lot more compact when it comes to the sleeping space. The size of the tent also depends on the size of your vehicle too and you want to make sure that it is going to be big enough to be able to handle the increased size of the larger options. If not, then there are plenty of options for all vehicles out there which are capable of having a roof rack. With a truck top tent you need installation to be easy due to the type of space that you are going to be working in. Being there on top of your ladders or on top of your car can be a difficult space and you don’t want to spend too long having to put it up. These products though are very well designed and will actually take less time to put up than a lot of standard tents. One of the reasons for that is there are aspects to regular tents which you don’t have to worry about such as driving in tent stakes or worrying about tent poles. Some are quicker than others though and there are other things to think about such as if they come with an annex or not, which will require a bit more installation than other types of roof top tents. Most of them though are easily going to be able to fold out without many problems but checking the instructions is always important until you have the hang of it. It’s also worth thinking about which side you will want to fold the tent out to. Some products will just fold to one side while others are more flexible and can be folded out to either side or can actually be installed over the back of the vehicle too, depending on your preference. Installation is one area that you might have worried about with these types of products but the truth is that the best models are very easy to install and easy to put up. It should only take you a few minutes until you are up and running and lying down on your mattress. The material of these tents is important for a number of different reasons as not only do you have the material that makes up the out of all tents but you also need to ensure that it has a strong frame, strong ladders and also that the mattress is going to be comfortable enough too. The material on the outside of the tent is most likely going to be made out of nylon which is a material that is commonly found in camping products due to the qualities that it has. It is very lightweight for its strength but it is also breathable too and will help to keep you cool in warm weather. Not all nylon is made the same though and one aspect to check is the denier rating that is has, which will be a ‘D’ after a number and this is an indication of how thick the material is and therefore how tough it is going to be. Another important aspect to check is if it is ripstop nylon, as ripstop is durable fibers which are added to nylon in order to give it additional strength. There are also canvas tents available which are heavier and more expensive but nylon is a lot more common. You also want to make sure that the material and rainfly has a waterproof coating too but this is something which should come as standard on every tent. The frame of the tent needs to be strong and lightweight which is why they are going to be made out of aluminum as this is a material that ticks both boxes and will be able to give you a solid surface on which to sleep. This will also be the same for the ladder too, which also has to be lightweight and durable. 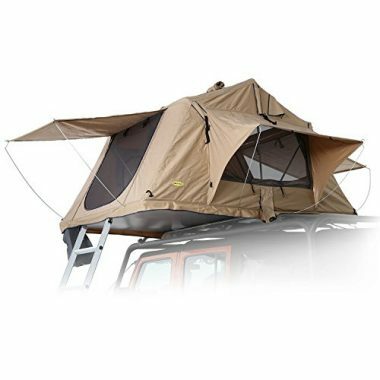 When buying any product it’s always nice for it to come with a series of different accessories but with these roof top tents there are a few things that you definitely need to have. All the products that we have featured come with the absolute essentials but some of them also come with additional accessories too and you always want the best car camping gear available. One important feature to have is a tent which is going to be able to protect you from the elements by having a rainfly or a canopy. This is going to be able to stop any condensation from building up in your tent when it rains and also it will help to protect you from the shade when the sun is shining brightly. The ladders are also a vital part of your roof top tent and you want to make sure that they are going to be of a high enough quality in order to be durable and support your weight. Most of these match the quality of their ladders to the quality of the product, therefore there is generally nothing to worry about. Another optional extra that some tents have is an annex which can be an additional sleeping or leisure space which is going to be able to extend out from the roof top tent and on to the floor. This is going to be able to give you a lot more room and increase the overall capacity of the tent. Some tents come with annexes as a part of their tent while others have the option to be bought separately. This can be useful for those who may be going on various different types of trip and will sometimes want that extra space and sometimes will be able to do without it. The weight of a roof top camping tent is important in terms of the actual weight of the product itself but also the amount of weight that it has in its capacity. When sleeping on the top of your car, you don’t want to underestimate it and end up falling through the floor so making sure that you are below the weight capacity is important. The overall weight of the product shouldn’t be too much of a concern but if you have a smaller vehicle then it’s going to make sense to get a smaller tent anyway as you might not have the roof space to be able to support a large tent. There is also the consideration of installation. If you are unable to hold heavier weights then installation is another reason that you should be looking into getting a smaller tent. Trying to install a large tent might be too much effort whereas a smaller one would be much easier. In terms of the weight capacity, this should be clearly detailed on the product as it is an important figure to know. This would be comfortable enough for two people but if one of the occupants weighs over 200 pounds then it is best to check that it is going to be able to support a large weight. Having the maximum number of persons and them being tall people who have an average build, for example, will most likely take it fairly close to the maximum weight. This just needs to be checked before you buy it and as you can imagine, larger tents have a larger weight capacity. The windows and doors are an important part of any tent. A lot of people like having a window to look out of which will make them feel less claustrophobic but there are other key reasons to have a window too such as its ability to let air in. The door is important too, especially with what type of camping product it is. The door is especially important as this isn’t a tent where you want to be fiddling around with the zip to try and get in and out. It needs to be able to open very easily so that you are not stood there on the top of the ladders trying to get it open with two hands. Also the entrance to the tent has to be sizeable too in order to make it as easy as possible to climb in and out of it. Again, this isn’t a space where you want to be struggling, especially when you are trying to climb down from the tent and onto the ladders. A wide opening with easy access is going to be an essential feature. Windows are another feature which will make the tent feel a lot more comfortable and be able to let in the light during the day and then be able to keep the light out when you are sleeping. These windows will generally be made out of mesh so that they are able to keep any insects out but will be able to let in the light, give you a view and let in some fresh air too. These windows though aren’t going to be waterproof and therefore it’s important that they have a cover from the outside. Most tents do this by having a canopy over the window which will be able to shield it from any rain. This is a vital feature, especially if you are going to be going somewhere that is particularly wet. All these products contain a lot of material including aspects such as the mattress and the ladders which traditionally take up a lot of room. It’s important therefore to have a roof top tent which is doing to be able to collapse own to a small enough size to make sure its portable. This is where you need to take into account the vehicle that you have and what it is going to be able to hold. 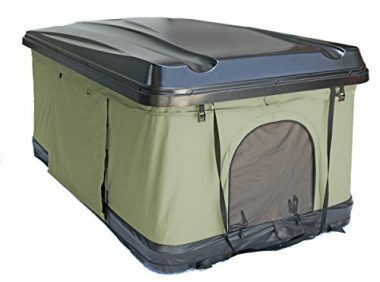 There are basically two types of roof top tent and the main one that we have seen here is the type that is going to be able to fold out from its fixed base and create a large sleeping area, possibly with an annex. While these have a larger folded out size, they actually take up less area on your vehicle when they are in their collapsed state. The reason for that is due to this folding out that happens where the area of the collapsed size is increased. 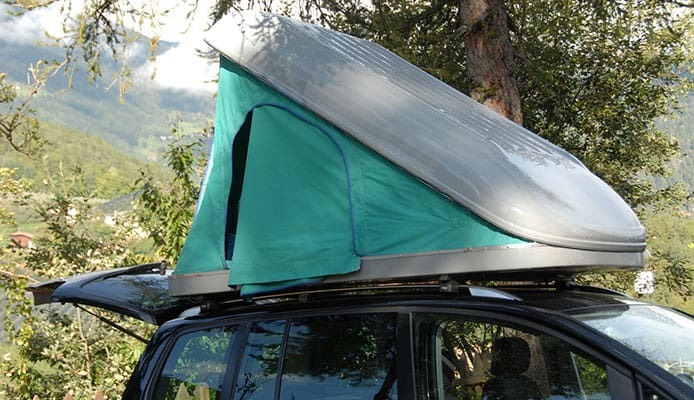 The other type of roof top tent is one that pops up out of the area that it is in. The advantage to these is that they are very quick and easy to put up and could take you around a minute to have your sleeping space. There are a few downsides to consider though before choosing your favorite type. Both of these types need to be fixed to either the roof or bed of your vehicle and if you have a very large vehicle then you would be free to choose any option. With a vehicle which has a smaller roof area though, a fold out tent might be your only option. With these products there are two key features on them which are difficult to make to a high quality when they have to be portable too. Therefore the build quality of the mattress and the ladder is going to be important to check before you buy it in order to make sure that it’s up to standards. The mattress that is included has to be both light and comfortable which are two things that don’t really go hand in hand. These mattresses though manage to achieve it and will give you a thick layer in order to sleep on and be able to enjoy a comfortable night. In order to have that weight and comfort, the mattresses are generally made out of foam which is going to be able to give you a nice level of support. Some products include memory foam which is going to be able to give you an even higher level of comfort than other types. Just like with the mattresses, the ladders also have to balance two aspects which generally don’t go hand-in-hand and that is the fact that they need to be both durable and lightweight. Aluminum does a very good job of bringing this quality and making it as easy as possible. The ladders also need to be highly adjustable too, every vehicle will have a slightly different height from the ground and your ladders need to be able to accommodate all the vehicles in order for you to comfortably get up to your tent. High-quality ladders are an absolute must for a roof top tent. Q: What Are The Benefits Of Using A Roof Top Tent? A: Perhaps the number one reason to get a roof top tent is that it is going to be able to keep you off the ground. This is great for a few key reasons as it will stop you being paranoid about any animals that might be on the ground but it also means that you don’t have to spend time finding the perfect camping surface. 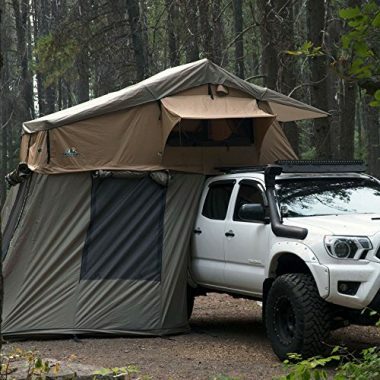 Getting the best truck camping tent is another great solution for this. It could be that you are on rocky terrain or it could be muddy or snowy, with a roof top tent none of that matters as you would be able to just get to your mattress and enjoy the raised comfort. Having that mattress is also a great benefit as you wouldn’t have to worry about bringing your own, sleeping on the ground or bringing a camping pad. They are also pretty easy to set up too and you don’t have to worry about any tent stakes and foldable tent poles which can be very tricky to use. On top of that, a roof top tent allows you to go anywhere you want and not have to worry about campsite selection, it allows you a lot more versatility to be able to go wherever you want. Q: Are Roof Top Tents Safe? A: You may see a tent on top of a roof and worry about rolling over and suddenly finding that you have dropped six feet to the floor. The reality, of course, is that it’s not going to happen and you would be able to sleep soundly knowing that you aren’t going to be falling out. Another area of safety is having to climb up and down ladders all the time which would be an area where dangers may occur. Here though the tents are very well designed and are very easy to get in and out of. It might feel more cramped sometimes than a regular tent but it is still going to be very comfortable. You could actually argue that roof top tents are actually safer than regular tents as you are going to be off the ground. This puts you out of harm’s way when it comes to any curious animals which might be wondering who you are. Roof top tents are very safe and you just need to be sensible in terms of getting in and out and making sure you are well lit. Q: Is A Roof Top Tent Going To Damage The Roof Of The Car? 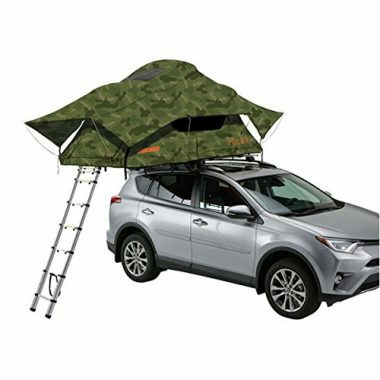 A: These roof top tents aren’t actually going to be coming into direct contact with the roof of your car. They are going to be installed onto your roof rack and this isn’t going to be too difficult to install. Once you are set-up, there is going to be plenty of clearance between your tent and the roof. When unfolding the tent, again, none of the hard parts of the tent are going to come into direct contact with your car. The hard floor will be folded out and the tent ladder will be pulled out well clear of your car, so you will have nothing to worry about. You obviously want to double-check the amount of weight that your roof rack is going to be able to carry but this is not going to be a problem. 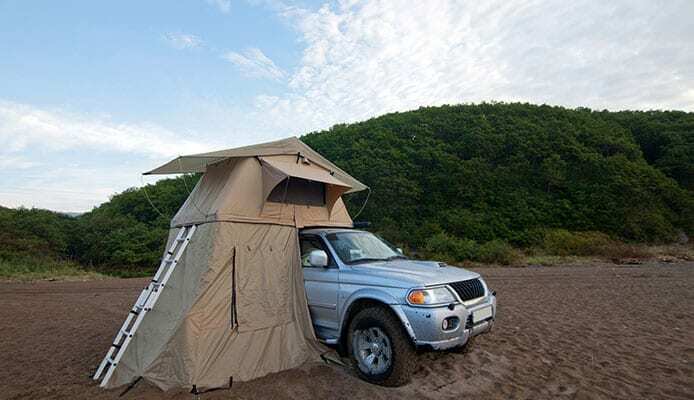 If you don’t have an annex then none of the tent is actually going to be in contact with your car and if you do have an annex, the only connection will be with the soft tent material. Using a roof top tent can be a brilliant way to head out there to camp and enjoy your trip, safe in the knowledge that you won’t be sleeping on the ground. 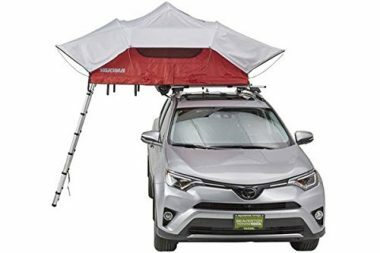 This is going to give you a brilliant level of versatility and will allow you to camp anywhere that you want, as long as you can park your car. When choosing the best roof rack there is clearly a lot to consider and you want to ensure that you are getting the perfect one for you. The first stage in that is going to be getting the right size for you. It’s important to know the dimensions of your roof rack and of your car to ensure that you are going to get the right fit. This is going to be a big factor in whether you are going to get a fold out tent or one that pops straight up. After that you want to ensure that your tent is going to be easy to install. It might take a bit of time on your first go if you’ve never had a roof top tent but once you are comfortable with it then it should only take you a few minutes, with a bit of a longer installation if you have an annex. After that you just want to make sure that the tent suits your style and your needs, with the right type of material, weight, windows and doors for you. Once you have figured that out then you are going to be able to choose the perfect roof top tent for you. Hopefully this guide has given you all the information and confidence you need to pick your ideal tent and head out there to start your new exciting camping adventure.